Since 1921, Würzburg has been hosting an annual Mozart Festival at its famous Würzburg Residenz, a UNESCO world heritage site, and at many other venues throughout the city. But Mozart did not have any personal links with Würzburg, so how did this month-long festival come to find a home in one of the most beautiful Baroque palaces in Germany? It seems that it all began with an evening of music at the Grand Emperor’s Hall of the Würzburg Residenz in the year 1921. At the end of the evening’s performance, Hermann Zilcher, the conductor, was so overwhelmed by the ornate stucco and lavish surroundings of the Residenz that he made the remark “I only needed to trace a certain piece of ornamentation with my baton in the air, and that was enough for a union between sound, architecture and colour.” Such a profound inspiration could not just be passed up and this led to the founding of the Mozart Festival, just a year after the Salzburg Festival began. When you visit the Residenz, it’s easy to see how this complex can be inspirational to anyone who is remotely creative. Even Napoleon referred to the building as the “nicest parsonage in Europe”. Its grand staircase has the world’s biggest unsupported ceiling fresco painted by Giovanni Battista Tiepolo. The Kaisersaal or Emperor’s chamber and the Hofkirche are richly and ornately decorated with paintings, sculptures and stucco ornaments. In fact each and every room is like an art gallery. The Würzburg Mozart Festival is one of the leading music festivals in Germany and many internationally renowned artists have performed here over the years. 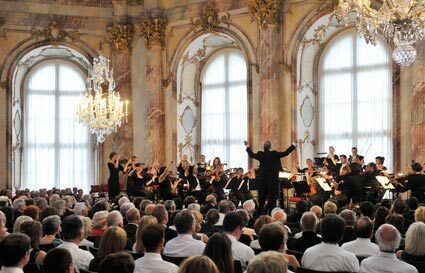 During the four weeks, thousands of classical music lovers from Germany and all over the world can enjoy numerous classical concerts in the intimate and unique Würzburg Residenz as well as the festival atmosphere at other famous venues around town. Würzburg is an enchanting town that lies on the banks of the river Main and there are lots of other sightseeing attractions to keep visitors occupied during their stay such as the Fortress Marienberg, the pilgrimage church “Käppele” and St. Kilian, the fourth largest Romanesque cathedral in Germany which houses artifacts from many centuries. Book Classical Concerts and Operas at many of Germany’s top venues online.